A daily headline topic in my house is Maggie’s Allergies and “the state of her rashes today”. Sometimes my significant other and I will get in a heated debate because we have varying opinions and of course I’m always right. So he has to concede… to let me stay in charge. I’ve recently found a few Facebook groups to help me through this journey. And I was just reflecting on this journey of ours. What I am learning is that there is not silver bullet to fix allergies. And the key thing is you have to realize what you’re addressing. In the case or Orbit she had yeast symptoms but it could easily be diagnosed as an allergy. If you look at the photo above … you can clearly see the condition of Maggie’s red (because it’s rashy) belly. That’s a normal sight to see when she has a flare up. But she isn’t affected other than having to occasionally scratch herself. The rest of the photos is a very good summary of our daily activities. I remember the vet saying Maggie could be allergic to grass and I just looked at him thinking – well I’m not putting her in a bubble. Anyway – I just joined the “dog allergy and heath support international group” on Facebook and below is how I introduced myself. I thought it would be good for yet another recap of our journey in learning how to fix Maggie’s allergies. I think I counted 17 times I made it a bullet point sentence …. so you can see Allergies are not easy. Copy of the intro in Facebook – I used the photo above of the girls in the tub. New member. 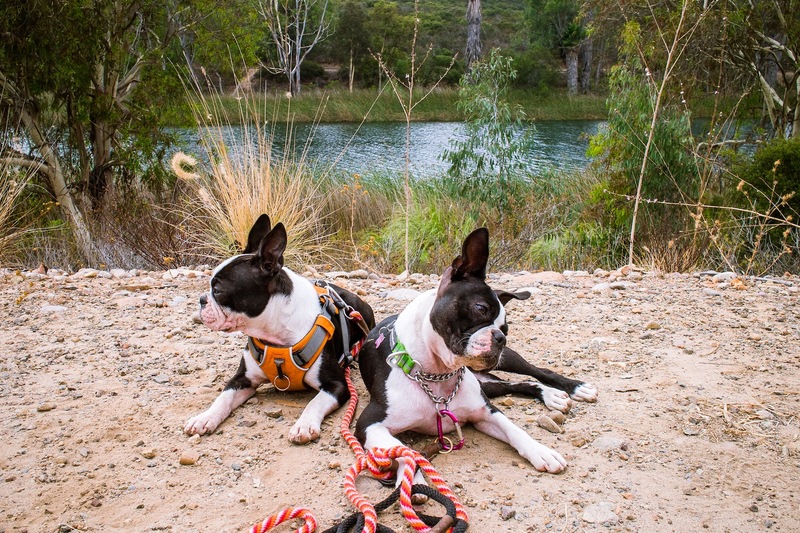 I have two Boston Terriers. The one on the left is Maggie she’s my allergy dog. The one on the right is Orbit. She used to be my yeasty dog but was able to solve that. Maggie is 2 and Orbit is 1. Maggie’s allergies popped up when she was 8 months. We did a round of apoquel which didn’t help. And twice she received allergy shots. I decided to go the natural path. – Daily water rinses in the evening (we go to the beach or local trails almost daily). – Cleaning with a diluted mix of betadine if she smells bad between baths. I think she might have signs of yeast that she got for Orbit who no longer has it. – Shampoo/conditioner with 3% chrolohexadine maybe once every 7 to 10 days. – green multivitamin from Animal Essentials. – collagen supplement. I actually saw a difference by adding this and when I run out her rashes come back much more easily. I use the one from Custom Collagen available on Amazon. – just bought Advantage flea drops in case she has fleas. Her rashes are under control meaning – if she flares up – I can do a cleanse on her body with colloidal silver and her bumps will subside within 30 minutes. I just discovered that stuff it’s miraculous. – Cut out chicken. I had gone back and forth on this but going to commit to cutting it out for 2 months. – I read a post here that said that some allergies could be induced by fish oil. So I did some research … I bought fish oil Feb 2016 and looked through her vet file … I see that her first allergy visit was end of February. Could it be a coincidence. So I stopped the oil this morning. – Just ordered some bovine colostrum made by Wholistic Pet. Orbit used to have yeast – which is gone. But they both started to chew scratch on their back hind legs and there are small bumps so wonder if they recently got bit from ants or fleas. Maggie’s rash on her belly – last breakout was yesterday and I applied Collodial silver and it went down but it’s still faintly red under the surface of her skin. * I’d like to do an allergy test – and have heard about the Glacier Peak or Nutriscan one and open to other suggestions before I commit. Maggie also doesn’t have that much hair on her belly where Orbit has more. Glad to be part of the group and try fix my girls from the inside out. 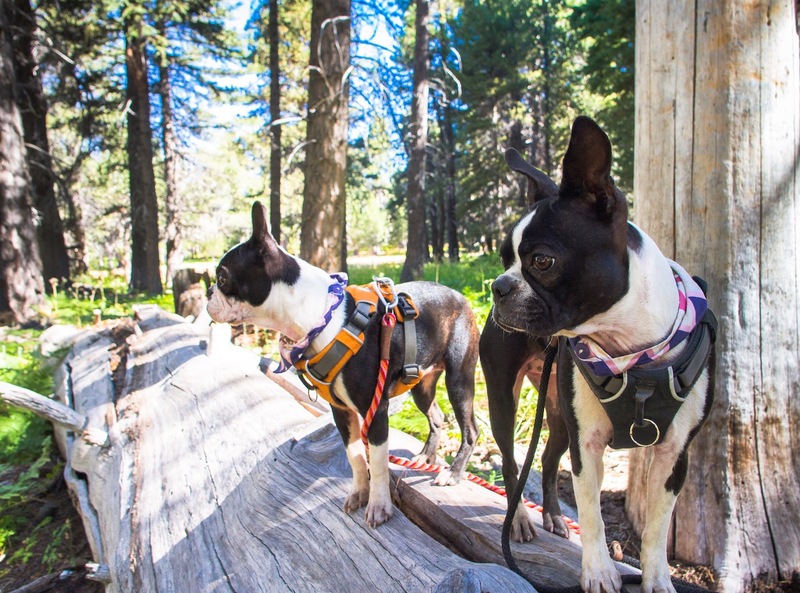 In any event … if you have an allergic dog I guess the moral of this post is that you are not alone and yes there’s a lot of factors to consider but don’t give up. Our dogs are counting on us to help them. I had the fortune in meeting the Co-founder Ruby Balaram of Real Pet Food and from the our time together I’ve already learned a few more things about allergies. She’s provided me some reading material as well as tips on pro and prebiotics so I’m going to digest this and work on applying a protocol for Maggie and update you in a few weeks on the outcome. Also if you want me to share the resource I was just provided contact me via the email link in our profile in our Instagram and I can get it to you. Disclaimer: I am not a vet. I am not making any recommendations either way. 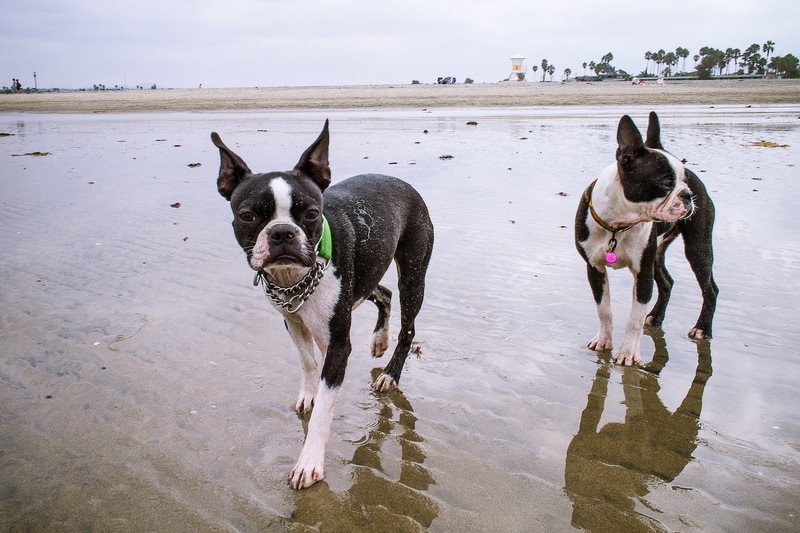 I’m simply sharing our journey to finding a holistic solution to Maggie’s allergies. Hi – yes it’s a journey. It’s been a year for us as well. Good thing you did the testing for Cody. Maggie is now 95% better … I’d say Orbit is about 55% better. We also just did that same allergy test (was that Glacier Peaks?). And I went to a holistic/integrative vet who put us on a protocol. I haven’t written an update because as you know – things take time. But in a nutshell for both I’m back to cooking for them. This is so I can isolate the ingredients to exactly what they CAN eat. I have added mushroom matrix supplement – and SKin & Coat issues are 90% better – hardly any itching. Other things my vet had us on were Glacier Peaks Gold drops, and then some supplements from Standard Process. She also gave us some Chinese Herbs. Each of my two had slightly different things prescribed to them. After a few weeks I’ll do an updated blog post with details but hesitant to do that now because I want to give the treatment time. Oh last thing – cleaning them with a diluted mix of provodine iodine has helped immensely. I’ve been doing that for about 2 months and it’s helped immensely. We just have to keep trying what’s best for our dogs. Sending you positive vibes. 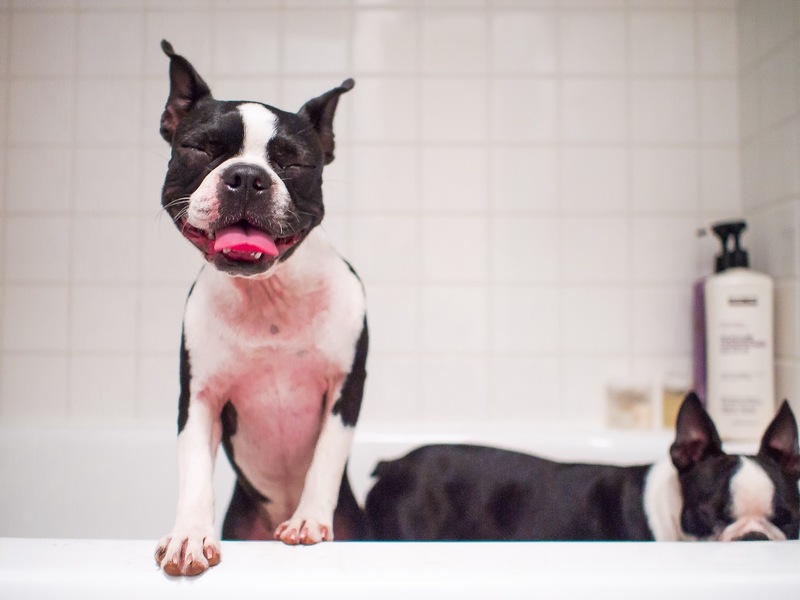 Hi Maggie and Orbit – I am Gilbert, a 14 months old Boston Terrier in Berlin. My person is spending a lot of time trying to find out what’s wrong with me (my behaviour and trainability is below par, according to her and our behaviourist). She thinks I have anxiety and lack focus in part because of my itchy skin and eyes. She will be following this blog, hoping to learn more. Hi Gilbert. It took us a while before we found a good holistic vet. Hope you can find one too.